Did you all have an amazing Mother's Day weekend? Not from scratch though...he used boxed brownie mix. But he made the topping from scratch. He said he got it from Betty Crokers' Cream Cheese Swirl Brownie recipe. Ryan likes to cook, you know. He actually does the cooking every weekend...but he had never made baked treats. 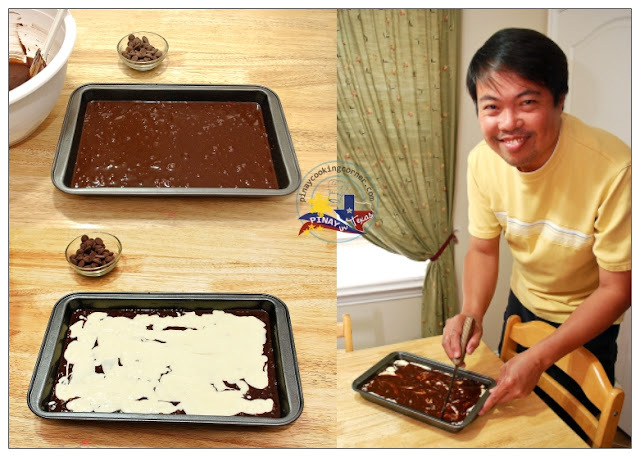 This is the first time that I've seen him baked something, so even though these Brownies with Cream Cheese Swirl Topping aren't 100% from scratch, I feel these are truly worth sharing! For someone who doesn't bake, the effort Ryan put into making them is indeed commendable. Neither did he hurt his fingers with the mixer nor overbake the brownies and burn the kitchen. :) I must say he did a pretty good job! And even though the swirls didn't come out really visible, I must say that these brownies are beautiful enough and are delicious too! They are such delightful treats to end my wonderful Mother's Day! 1. Preheat oven to 350ºF. Grease a rectangular or square pan. In small bowl, beat topping ingredients with electric mixer on low speed until smooth. Set aside. 2. Prepare brownie batter according to package directions. Fold in chopped pecans. 3. Spread 3/4 of batter in prepared pan. Spoon topping by tablespoonfuls evenly onto brownie batter. Spoon remaining brownie batter over filling. Cut through mixture with knife several times for marbled design. Sprinkle with chocolate chips. 4. 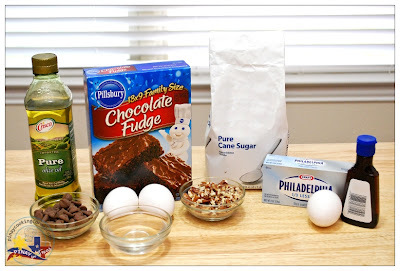 Bake for 35 minutes or until toothpick inserted in brownie comes out clean. Cool completely, about 1 1/2 hours. Slice and serve. Congratulations, my dear...and to everyone who joined, thank you so much!!! Sounds like you were really spoiled! 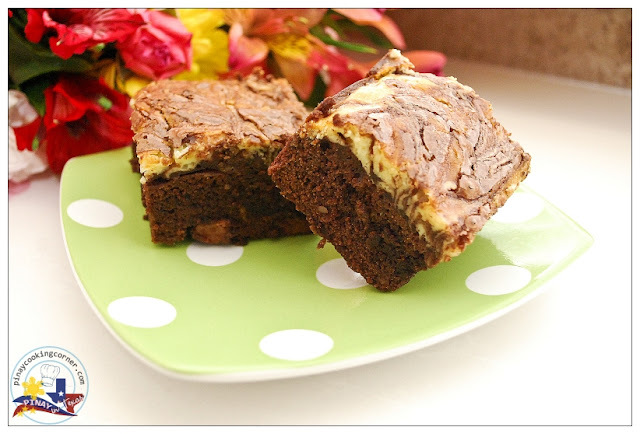 I love these kind of brownies when you need a great dessert quick. Your husband is commended for his great effort! My husband used to do a little cooking until we were married. I'm trying to encourage him to try a little- he will help me prepare the food at times ;) So I can't complain too much. I admire guys who help out in the kitchen! They're awesome! Awww ... how sweet! He spoils you ... but you deserve it really. You're such a great mum and wife. Happy Day! Tina , don't be mean and just add Ryan as your co-writer then ! hahaha He did a pretty good job indeed ! 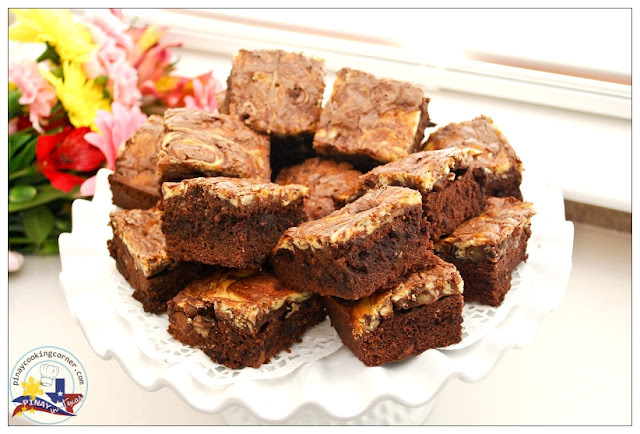 So sweet of your husband and kids to make breakfast and these yummy brownies. That's fine if they used brownie mix. The good thing is that they though to make something for you. Tina I have shared an award with you, hope you will accept it. clap...clap...clap...I wish my hubby could bake like Ryan, he also cook for us occasionally =) Ryan's brownie looks delicious. sounds like a great mother's day and I love that Ryan made the brownies! Great job Ryan! 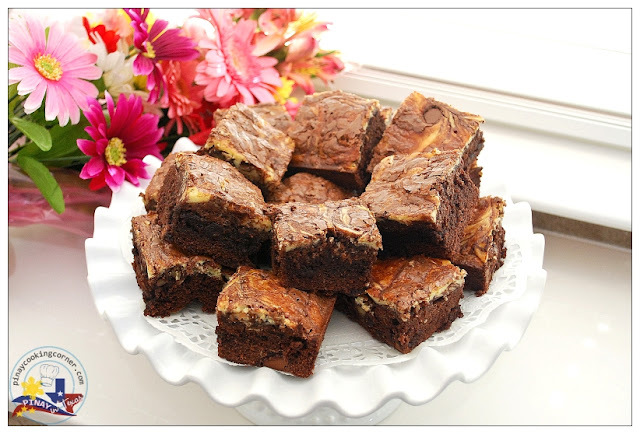 aww....thats so sweet of him....to prepare breakfast and these yummy brownies...these surely looks very very delicious !!! !loved the cream cheese topping....n belated wishes for mother's day !!!! I am glad you had such a fabulous mothers day my friend! awesome! i love brownies with icecream. Oh yes, I'd a great time & I hope u too! These bakes are lovely & congrats to the winner! Tina, chk this out: May BellaBox Comes With A Reusable Bag!! This is my favorite kind of brownies! And Ryan did a fabulous job!